I love summer. And I love America. And I love pie. All of these three wonderful things come together and remind me of how magnificent they all are every year in late May, when flags fly, the kids go to school and learn nothing, and my hands are busy kneading shortening into flour. Memorial Day’s true meaning is solemn, important, and serious. But I would be remiss if I didn’t equate it to the un-official kick-off of summer. Grills everywhere are firing up, people are mixing together giant bowls of potato salad and wondering why anything so delicious seems inedible during all of the cold months of the year. Flip-flops start flopping, shorts start revealing our winter white legs, and I will be busy making pie. Some say pie is the dessert of fall, a typical Thanksgiving tradition. Those people are really missing out. For me, pie tastes best in the summer, served on a paper plate with a plastic fork on a red gingham covered picnic table. Berry, lemon, cherry, apple, peach, they all make my mouth water when I imagine a hearty crust dusted in sugar crystals. Seasonal fruit coupled with the slightly freakish stockpile of crust dough that I keep in my freezer makes for one perfect dessert. You might be surprised to know, however, that pie wasn’t always a dessert. In fact, according to an article in TIME magazine, the first “pyes” in Medieval England were meats such as beef, wild duck, or pigeon, and spiced with pepper and dates. To me, this does not sound like a good way to end a session of hot dogs. 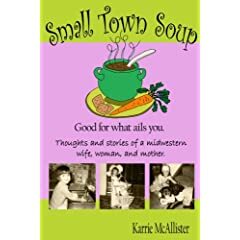 The same article informs us that historians traced back the initial origins of pie to the Greeks, who figured out that if they mixed flour and water, they could press it into a dish and fill it with lovely things like mussels. Again, not how I would choose to end a picnic, but to each his own. The first sweet pies as we know them didn’t start coming about until colonists starting showing off local produce. Perhaps when the meat ran low they started stuffing the crusts with fruit and inventing the first contemporary American pie. A cookbook from 1796 listed three sweet pies, which were probably considered bizarre and new-fangled. 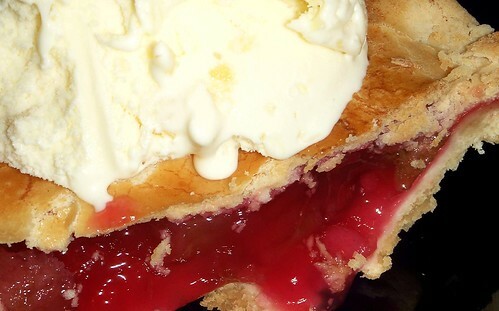 But by the late 1800’s, Americans had swiftly learned how much more delicious it is to fill a crust with sugar than protein and cookbooks of that time featured a whopping eight sweet pies. By 1947, we were all fat and happy and pie as we currently know it was catching on like wildfire. Modern cookbooks listed over 65 versions of dessert pies. For this, I am grateful, mostly because my grandmother was raised in the prime pie making years and she makes one incredible apple pie, which I will eat voraciously while I still can. I can follow her same recipe and yet it never tastes as good as when she bakes it. My birthday, which falls in the height of summer, is always celebrated with a few candles leaning haphazardly in such pies, forever dripping wax and threatening to carmelize the sugar. But I wouldn’t have it any other way. Who needs cake when fruit is in season, the flag is still flying, and Grandma’s baking? A simple glance at the grocery store aisle will tell you that there are about 5,639 different types of tea out there. You might find it interesting that all true tea comes from one single plant, and different varieties are created by different ways of processing the leaves. Herbal blends are not actually teas by definition. This is all well and good, but when it comes to hot water you pour over some sort of withered up leaf, the outcome is usually the same: A hot beverage served best when with a friend. I am no stranger to a mug of tea with honey when I’m feeling under the weather or a cup of chamomile when I just want to calm down. And I’m not the only one who “self-medicates” with tea. There are even fancy brands out there that cleverly put their cause in their name. Immuni-Tea, for example, keeps you healthy. Longevi-Tea keeps you around. Fertili-Tea, as the name states, creates a world of chaos in your home filled with tiny shoes and pacifiers. But besides those simple names, I believe there are other “teas” in your life. And while they may not line the shelves, they certainly have an impact on you. Most lives I know start with diaperabili-tea and end in finali-tea. Somewhere in between the two is usually a bit of maturi-tea. But there are more than just those. For the ladies, there’s feminini-tea, which would probably be a sweet blend of roses and powder, smooth as silk and certainly served piping hot. For the men, perhaps masculini-tea, a mixture of sweat and elbow grease, grass clippings and fishing. Yum! For mothers such as myself, I imagine insani-tea, which in my case would taste like reheated macaroni and cheese that I eat out of a plastic container standing next to the microwave, or maybe a handful of cold, crunchy fries that I stole out of my kid’s fast food bag because the person at the drive thru forgot my sandwich as we rushed to some practice and I wonder how many cups of stupidi-tea that person drank before coming to work. If you truly could drink yourself to whatever you want to be, I’d surely find myself buying case after case of tranquili-tea and simplici-tea. Of course, I’d have to keep the tea bags in my car where I spend most of my maternal life. And when it comes to writing these columns, at times I could use a good steaming mug of creativi-tea. My favorite new blend of tea, however, would have to be communi-tea. Because it is within a group of friends and peers that we seem to be the most at peace. My own friends warm me like nothing from the finest china ever could, and it is from those friends and neighbors that I have gained the more knowledgabili-tea than from anywhere else. I recently gave a talk for a group of lovely ladies and as part of the program, we all shared our response to the following sentence: “A friend once told me…” The answers, in their loveabili-tea, speak for themselves. A friend once told me… your smile keeps us all happy. A friend once told me…to take life with a grain of salt and wear clean underwear. A friend once told me…you learn more if you just keep quiet. A friend once told me…something to keep in confidence and I did and I have. And now I don’t remember what it was. A friend once told me…I was widowed two years ago and have no intention of dating or remarrying. But the young man at work told me I should stuff my cats when they die and place them around my house. Then when I bring men home, if they are OK with them, he’s a good one. I friend once told me…there are only so many things you can share at a tea party. To all the ladies out there, may your cups be filled with beau-tea, quali-tea, and vitali-tea. And may it all be served with a close friend and full of laughabili-tea. First of all, I will not reveal where I find my mushrooms, so don't even bother asking. But I will reveal this yummy recipe which is an adaptation on a tiny little blurb that showed up on the bottom of a page in an issue of Cooking Light. Cook bacon in skillet. Remove when done and set aside. Add butter to pan and saute mushrooms for around 4 minutes. Add asparagus, salt and pepper. 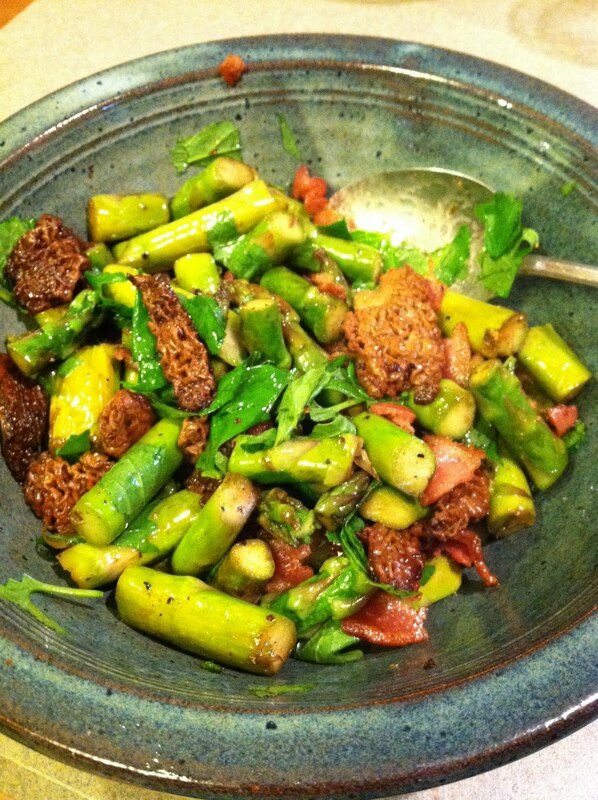 Saute 5 minutes or until asparagus is crisp tender. Remove from heat and sprinkle with bacon and chopped up garlic mustard. I added a bit of olive oil to make it saucier. I also added a splash of balsamic vinegar because I like that flavor with asparagus. I also ate most of it myself because my family is anti-mushroom. The world is full of mothers. And we as the type who tote around diaper bags and sit through piano recitals are really no different than the weeds in our front yard. Every Mother’s Day I am reminded of that crazy bond that females all around the animal and plant world share. Call it instinct, call it insanity, but that whole business of having children is just how the world works. Ask any naturalist or biologist, and they will tell you that if something in this world is living, it has a very specific task to do before it dies: Make more of itself. Consider the mayfly, which hits adult status for roughly three hours before it dies. Within those three hours, they all become parents. The plant world also has a deep need to make more of itself. The average apple has around five or six seeds in it, the average pumpkin anywhere from 100 to 700 seeds. One single dandelion will produce around 2,000 of those little whispy things to blow away in the breeze, planting themselves wherever they may. Preferably in your neighbors yard, but with a stiff breeze or a wishing child, they could end up just about anywhere. A mature oak tree will make somewhere around 100,000 acorns in a season, each one dropping to the ground when the time comes. And a full grown maple tree with its telltale helicopters or whirlybirds number in the hundreds of thousands when it comes to its seeds. Add up all of those numbers, and you’ve got a whole lot of babies. Probably more babies than the world could handle. I imagine a landscape full of apple, oak, and maple trees, all covered in mayflies while billions of rabbits munch on zillions of dandelions and pumpkins below. Fortunately this is not the case, but I’m sure the squirrels and pancake lovers would be happy. For all the absurdity, there’s a point that brings us homework-helping broccoli-feeding moms a little closer to these wild things. We want more of ourselves, and we want those things to do well. Dandelions might not be able to place each puff of seed in a safe place, so they send out thousands. Oak trees certainly have no defense against the squirrels and the mayflies are no match for a hungry fish or my windshield. They make lots. We, thankfully, don’t have to. Instead our nature is to protect each and every one of our offspring, to guide them and teach them and keep them healthy and warm no matter how often they drive us up the wall and back down again. We are wired to love more and want for so that they want for nothing and know the feeling of love. And so on this Mother’s Day, I salute all the mothers of the world, both human and otherwise. To the ones who send their seeds out to the mercy of the wind or their future to the fate of the squirrels, to the ones who wrap their children in bubble wrap and to those who tend towards wrapping in Band-Aids, to those who live only to be a mother and those who are mothers month after hopping month, to those who have watched their children grow and lost their children before their time, I celebrate each and every one of you. And your mother, ‘cause she’s pretty special, too.